Stillhouse Hollow Nature Preserve is located in the Northwest Hills neighborhood just south of Spicewood Springs Road, and is part of the Balcones Canyonlands Preserve system. This 20-acre stretch of parkland features many native plant species, and provides habitat for several listed endangered animal species, as well as 89 recorded bird species, making it a popular destination for birdwatchers. In its original state, the preserve had a paved trail that was installed along a winding path down to a wooden deck which overlooked the canyon and a flowing spring. Along the path several rough-hewn benches were also installed. Over many years, and many visits from bird watchers and hikers alike, these benches fell into disrepair and eventually had to be removed completely. Recognizing the need for some quiet resting spots for the preserve’s many visitors, the Friends of Stillhouse Hollow applied for one of Austin Parks Foundation’s ACL Music Festival Community Grants to help fund the revitalization of this beloved nature preserve. In 2014, with support from the Travis Audubon Society and NWACA, Stillhouse Hollow applied for and was granted $13,550 from APF to install sturdy metal benches, as well as an interpretive signage kiosk to give visitors more information on the park and its resident flora and fauna. After over a year of hard work, the park’s newest amenities are now open to the public. 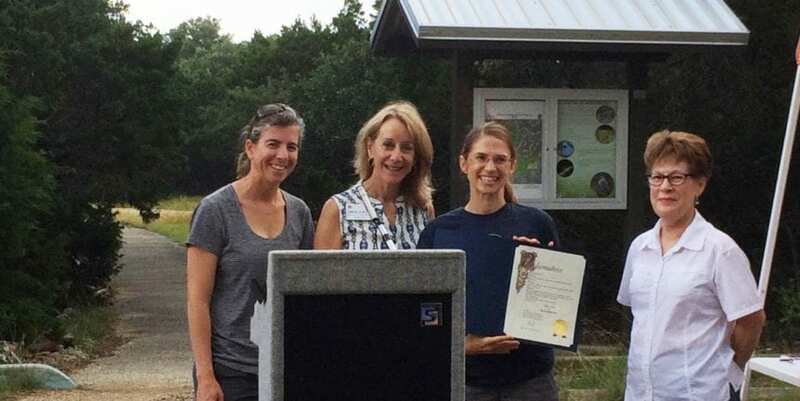 APF attended the ribbon cutting on National Trails Day – June 11, 2016, to celebrate the hard work and dedication of the Friends of Stillhouse Hollow Nature Preserve. “This is a marvelous little oasis in our neighborhood! We would like to add more amenities to the preserve to make it even more attractive to encourage more people to experience it.” said Joyce Statz, President of NWACA.